Today’s blog is a continuation from yesterday….Rick Carr, Senior Building Designer for Hansen Buildings shares his thoughts on planning his new pole barn cabin. From JA Hansen, co-owner of Hansen Buildings….Thanks Rick! After deciding that I want to do a crawl space, several design issues arise and decisions on how you will deal with those issues can affect how the building is designed and ordered. All reading on crawl spaces emphasize making sure that you avoid moisture issues in the crawl space. Next you need to do something to avoid losing heat to the ground and out the sides of the crawl space, this crawl space being above grade. How tall do you make the crawl space? Do you “condition” the crawl space? How do you insulate it if you do “condition” the space? Most crawl spaces are underground with a foundation wall, but that is not the case with post frame buildings so there is very little information out there on how to plan the post frame crawl space and to “do it right”. 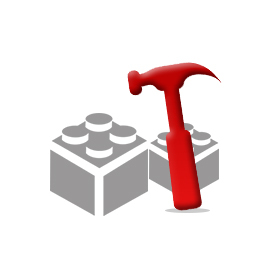 I have read the five blogs articles on crawl spaces, but there are still unanswered issues. I will present what I think that I want to do and I’d like to get Mike the Pole Barn Guru’s ideas on it with a question or two. I plan to condition the space, so I would put down between 6 and 10 mil plastic, then 2 inches of foam board insulation followed by pouring a concrete floor, just enough to keep critters out. I plan to use BIBS insulation in the walls, so I would extend that down the exterior crawlspace walls to the concrete. The radiant floor heating people that I am talking to have recommended that I put between R-13 and R-15 insulation on the underside of the sub-floor. The reasoning is that heat wants to move to cold and that you don’t need the crawl space heated to the same temperature as the living space; so insulating the underside of the floor keeps most of the heat up in the living space. I need to talk to the insulation contractor about what type of insulation to use here. Spray foam might be good, but the spray foam would make working on any plumbing or electric that is run below the floor very difficult, partially defeating one of the purposes of having the crawl space. The plastic with the concrete over the top should control the moisture issues coming up from the ground. The 2 inches of foam insulation under the concrete should help to prevent losing heat to the ground. The concrete should keep critters out and allow using a “creeper” to move around down there. I haven’t decided on the height, but I’m thinking that it should be three feet. When on all fours, I am almost three feet tall. I am 6’3” and it has to be functional. I would need assistance to figure out how high to make the top of the floor to yield the three feet considering the concrete and foam. I have not yet discussed this plan with the building inspector. So Mike, the questions; do you think that this is a good plan? Would I be able to put in the 2 inches of foam board and the 2- 2 ½ inches of concrete (normal concrete floor being 3 ½ inches) without doing anything different to the splash boards considering that the splashboards are 2×8’s and that there will not be any door thresholds to be worried about? 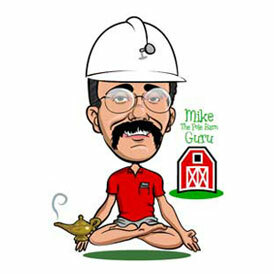 Stay tuned for Mike the Pole Barn Guru’s answers in an upcoming blog. 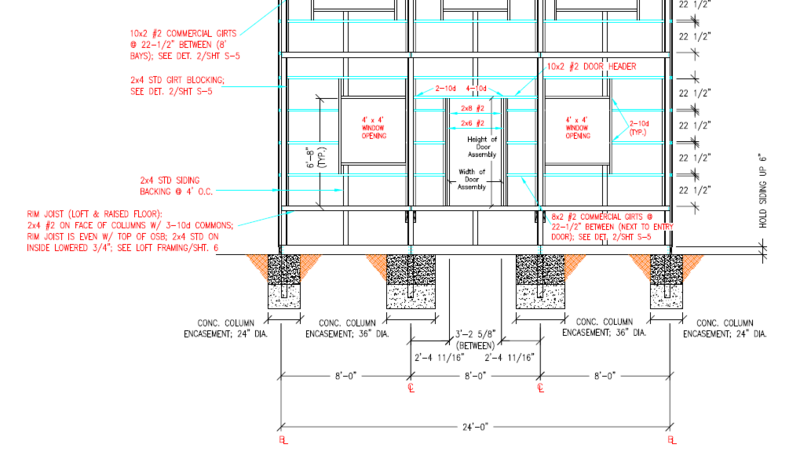 This entry was posted in Insulation, Pole Barn Design, Pole Barn Planning, Concrete, Footings and tagged BIBS insulation, Foam insulation, spray foam insulation, pole barn crawl spaces, radiant floor heating, splashboards on March 22, 2019 by admin. DEAR MARK: I’m going to have to do some guessing as the math doesn’t quite work out. If your “uprights” are on ten foot centers then the space between the columns will be 9’6”. If the space between is 8’6” then your columns are nine foot on center. Ceiling will be easy – as long as you have a thermal break (e.g. reflective radiant barrier or similar) insulation can be blown directly on top of the ceiling. If no thermal break has been provided, then a layer of spray foam insulation should be applied to the underside of the roof steel. For the walls, the first step – remove the wall steel, one wall at a time. 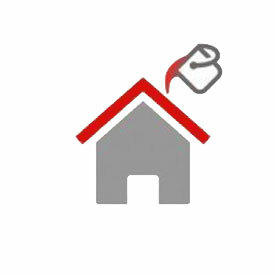 Install a good quality building wrap (https://www.hansenpolebuildings.com/2012/11/house-wrap/). How the inside is handled will be based upon the materials being used on the inside of the wall. For materials which will not crack (steel liner panels, OSB, or plywood) 2×4 wall girts can be added to the inside of the columns “barn style”. For sheetrock, things get a little more dicey, as the original design of the building should be checked by a RDP (Registered Design Professional – engineer or architect) to verify the building is stiff enough to keep deflection within allowable limits. Provided the building is adequately stiff, 2×4 or 2×6 wall girts can be added “bookshelf” style (https://www.hansenpolebuildings.com/2011/09/commercial-girts-what-are-they/). Once any electrical work has been completed in the walls, unfaced batt or BIBs (https://www.hansenpolebuildings.com/2011/11/bibs/) can be added to the wall assembly. A well-sealed vapor barrier needs to be placed on the inside of the wall insulation https://www.hansenpolebuildings.com/2013/07/moisture-barrier/. DEAR POLE BARN GURU: Have you ever tried using stands under your posts before you pour. I like the concept brand “X” uses, just seems a little overly complicated. DEAR SCOTT: Without knowing who Brand “X” is, hard for me to comment on their methodology. I have not personally tried the use of stands, however I have written about them: https://www.hansenpolebuildings.com/blog/2014/05/one-pour-reinforcement-cage/. DEAR SUSAN: Most certainly. As we are seeing more and more people gravitating to pole barn (post frame) technology for dwellings, we are designing more homes over both crawl spaces and full basements. We design pole buildings for folks with crawl spaces quite frequently. You can read more about pole barn crawl spaces at: https://www.hansenpolebuildings.com/2013/03/crawl-space/. Or, if a crawl space isn’t enough, a basement: https://www.hansenpolebuildings.com/2013/04/basement/. 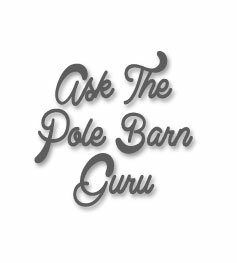 DEAR POLE BARN GURU: I have been planning a 24 x 48 x 10 three sided barn as it fits my needs for equipment storage and heat build-up and natural light. 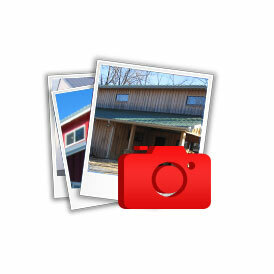 I read your blog on 3 sided barn vs. wind. My barn would be enclosed on the long north wall and the short east and west if I left open the east wall would that be enough to alleviate the wind pressure concern. DEAR BUDD: From reading my article on three sided buildings (https://www.hansenpolebuildings.com/blog/2014/03/three-sided-building/), you have found out it may not be the most economical design solution. Ideally, you would be able to construct a four sided building. The three sided design works fine structurally, as long as it is properly designed to resist the added loads. If you leave a long side and a portion of one of the other walls open, then you could reduce the wind pressures. In any case, I would recommend you seek out the services of a firm such as Hansen Pole Buildings – who can arrive at a solution which is structurally sound and best meets your needs. This entry was posted in Insulation, Pole Barn Questions, Pole Barn Design, Building Styles and Designs and tagged BIBS insulation, Foam insulation, setting posts, three sided pole barn, pole building basement, post stands, pole barn crawl spaces, equipment storage pole building, reflective radiant barrier on July 27, 2015 by admin.